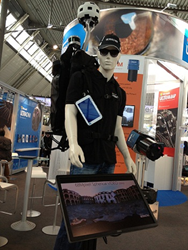 No longer tethered to tripods and static data capture, mapping and surveying have gone mobile, thanks in part to innovative implementations built around Velodyne LiDAR’s compact 3D real-time sensors -- as the company demonstrated in 12 diverse integrations at the recent InterGEO 2015 in Stuttgart, Germany. Drawing attendees from around the globe, InterGEO 2015, held Sept. 15-17, is the world’s largest surveying and mapping tradeshow, showcasing the latest technologies to capture the world in 3D. o Backpack-based surveying. At InterGEO, Velodyne’s compact VLP-16 LiDAR Puck – a lightweight 16-channel 3D, real-time scanner -- proved an integral part of systems on display by Microsoft and Leica Geosystems. 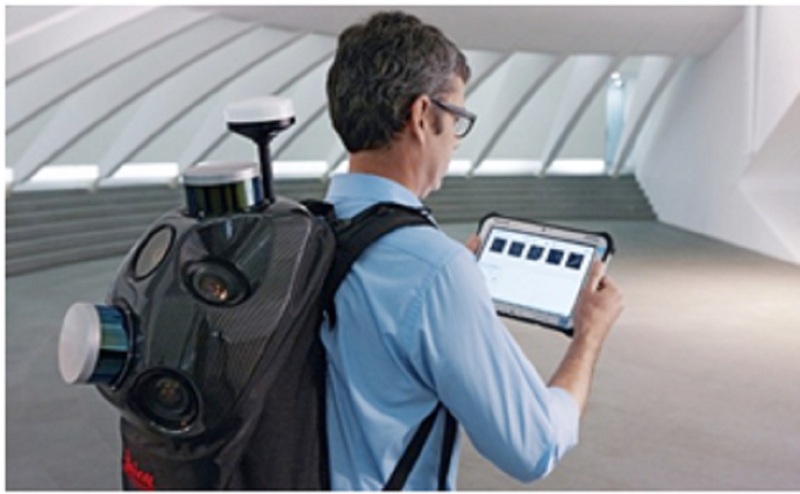 Leica’s backpack -- which received the prestigious InterGEO Wichmann Award during this year’s show -- sported two of Velodyne’s LiDAR Pucks in order to obtain almost full 360° coverage in horizontal and vertical directions, with remarkable point cloud density. o Vehicle-based mapping. Leica also displayed its established Pegasus II vehicle-based mobile mapping solution, with the optional Velodyne HDL-32E 32-channel sensor on board. Topcon (https://www.topconpositioning.com/mass-data-and-volume-collection/mobile-mapping/ip-s3), another major player exhibiting vehicle-based mobile mapping solutions, showcased its IP-S3, which also deployed Velodyne’s HDL-32E, in combination with a camera and its world class, in-house navigational equipment. o Segway-driven mapping. Swedish company Satlab (http://www.satlabgps.com/en.aspx) turned heads on the InterGEO show floor with a novel, real-time 3D integration of Velodyne’s compact VLP-16 on a Segway, complementing its vehicle-based mapping solution, also on display at InterGEO, built around the HDL-32E. o Marine implementations. In addition to displaying an HDL-32E-based mobile mapping solution under its Zenith brand, Dutch innovator Seabed (http://www.seabed.nl/) combined Velodyne’s 16-channel LiDAR Puck with a multi-channel sonar scanner, enabling 3D measurements above the water line – and, submerged, below the water line. o Airborne mapping. A number of system integrators at InterGEO offered airborne LiDAR solutions, among them leading UAV provider Phoenix Aerial Systems (http://www.phoenix-aerial.com/). Phoenix Aerial showcased its third generation AL3 platform using the HDL-32E with application examples ranging from power line inspection to oil & gas and in the mining sector. Phoenix’s attractively priced “Scout” system sported a lightweight VLP-16 for similarly demanding applications. o Forest management. Specializing in UAV-based LiDAR solutions used for forest management, LiForest’s Li-Air (http://www.liforest.com/?p=14132) captured point clouds with both Velodyne’s sensors, the HDL-32E and the VLP-16. The Li-Air solution analyzes the point clouds to isolate individual trees and establish databases that contain tree height, volume and density measurements -- all attributes deemed vital when managing a commercial forest effectively.